The MP-8C Midwest Pacific Hand Impulse Sealers have built-in cutters in the upper handle jaw. The cutter is slid from side to side with one hand while the other hand holds down the handle to accomplish sealing the bag. Both functions, sealing and cutting, are accomplished at the same time, making creating of a sealed, trimmed bag very efficient. The MP-8C Midwest Pacific Bag Impulse Sealers with built-in cutters are very efficient when using tubing, because you can literally "make a bag" of any length from a roll of tubing. The seal provides a strong airtight, waterproof seal for bags made of polyethylene (PE), polypropylene (PP), saran, some laminated, lined metalized and foil materials. NOT recommended for cellophane or similar, Mylar, some foils and metalized. These machines only use power and get hot when the seal arm is depressed. They cool immediately after sealing. They have a solid-state timer adjustable from .3 seconds to 1.2 seconds for sealing bags of various thickness. (Maximum of 6 mil. for PE). 110 volt standard. They are very sturdy, yet lightweight and easy to transport. Click Here For MP-8C Parts. Maximum Material Thickness - 6 mil. 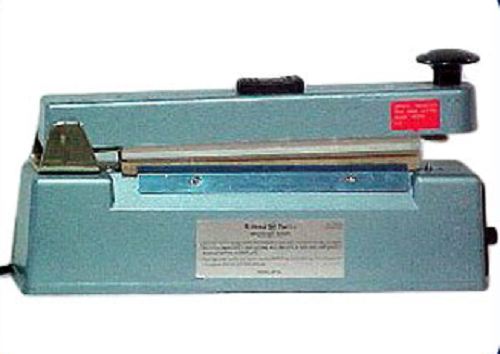 According to the manufacturer, Impulse Heat Sealers are best suited for KEL-F, POLYFLEX, P.V.A., POLYETHYLENE, POLYURETHANE, POLYVINYLCHLORIDE, POLYPROPYLENE, PLIOFILM, TIVAC, SARAN and most other heat sealable materials. 89 points will be rewarded to you when you buy this item. If your points show zero, make sure to select a product and points will be rewarded after checkout.